Polypropylene Safety film, square plastic case,?fill flame resistant resin with good self-healing effect. 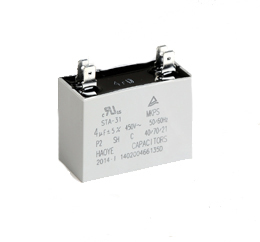 stable capacitance, low loss, high reliability, Safety Class: S3, safe and reliable. Air-conditioning, washing machine, electric fan and other white household appliances.